Note: This tutorial is updated to use Pipenv. When building a modern web application with tools such as Django and React, React will take care of rendering the view layer of your app and Django will be used for communicating with the database and exposing a CRUD REST API. You can have completly separate front-end and back-end or you can also make Django serve the first page where the React app will be mounted (we'll follow this second approach in this tutorial). The communication between React and Django will be made using HTTP/Ajax requests to the rest API endpoints (we'll use Axios but you can also use the modern browser's fetch API or even the old XMLHttpRequest interface or a wrapper library around it). In the back-end we'll create a simple Django API with Django REST Framework. In the front-end we'll consume the API (with Axios) to fetch data and then render it. We'll also add routing using the React router version 4 and Redux for managing the global state of the application. This tutorial assumes you have a development environment with Python and NodeJS installed. You can find the binaries and the instructions to install on both platforms in their corresponding official websites. It's recommended that you use python virtualenv. A tool that allows you to create isolated virtual environments for Python packages so you can install and use different versions of the same library (for different projects) and avoid any conflicts. You can install virtualenv using the virtualenvwrapper. You should have the famous It Worked! welcome page when you navigate with your web browser to http://127.0.0.1:8000. If everything works as expected. The next step it to integrate Django REST Framework and React. Webpack generates the bundles for your app with hashed filenames so we need a way to track these filenames automatically without having to manually change your template to include the correct filenames, particularly in the development phase where they frequently change. webpack-bundle-tracker is a Webpack plugin that outputs a JSON file (webpack-stats.json) containing the information we are looking for i.e the names of the bundles. By issuing a few commands you can generate a React app and start building your next app without going through any Webpack configuration. If the command fails you can try with sudo to execute the install command with the super user priviliges. This will start the Webpack development server which serves your app locally with hot loading i.e when you change anything in the source code the server reloads your app automatically. This will import the bundle tracker plugin and add it to the list of Webpack plugins. We set the path to ../ to point to the root folder of your Django project and the filename to webpack-stats.json. This will setup the bundle tracker to generate a file named webpack-stats.json for the bundles information in production. Let's first create the Django template (and its related route and view) where we are going to mount the React app. We need to create a template in templates/main.html after making sure you have configured Django to find your template files. To integrate the Django and the React applications we need to serve the front-end (i.e the React app) using the Django server. The process is simple but we have one problem though! Webpack generates the React bundles dynamically and with hashed filenames so we'll need to use django-webpack-loader--a django application which injects the dynamically generated bundles using the <script> and <link> tags into the Django templates. Using the Webpack loader Django will be able to know which bundle to load in the template. The render_bundle tag takes 'main' as an argument and renders the script tag for the main bundle. 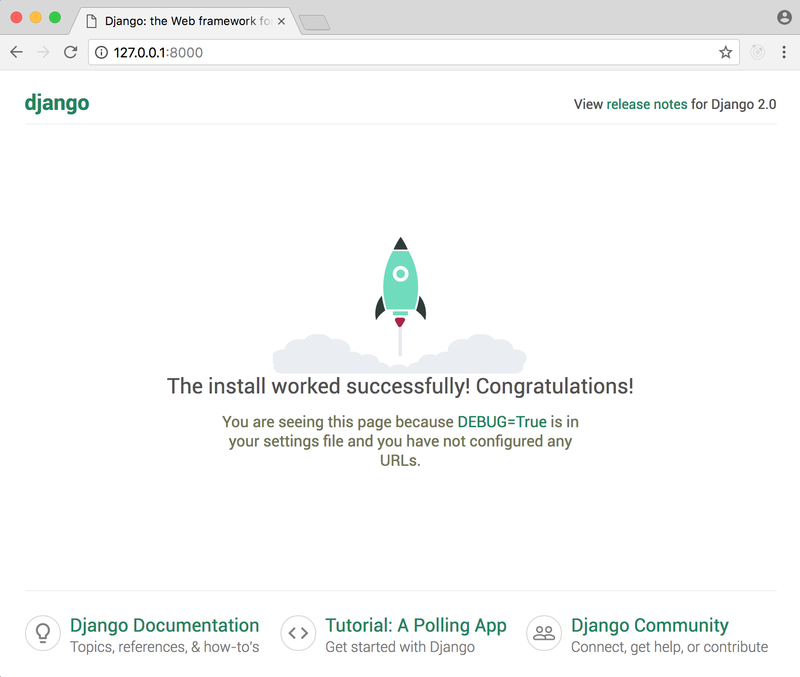 Now you need to start your Webpack server and your Django local development server then navigate to http://localhost:8000/ with your wen browser. You should be able to see the React app running at this address. This tells the Webpack server to accept requests from all origins including http://localhost:8000. Also make sure to set publicPath and publicUrl to 'http://localhost:3000' in config/webpack.config.dev.js. That's all you need to do to integrate React and Django for the approach we have followed. In the next tutorial we'll add React routing using react-router-dom then we'll see how to use Redux to manage the app global state. Meanwhile if you have any problems integrating React with Django feel free to post a comment below and I will be glad to help you! We have seen how to create a React front-end for Django web apps using the Create React App project generator and how to send http requests from React to Django.